Kootenay Lake is located in southeastern British Columbia, Canada. The ghosted image on the left shows western North America where the border between Canada and the United States intersects the Pacific Ocean. The highlighted region in the centre right shows the position of the Lake, just north of the boundary between Washington and Idaho. This region around the Lake is enlarged on in the image on the right. Further, this image can be zoomed (+ -) panned (← ↑ ↓ →) and reset so the Lake and its surroundings can be explored in even more detail. For this image to be seen and navigated, the Flash Player must have been installed. 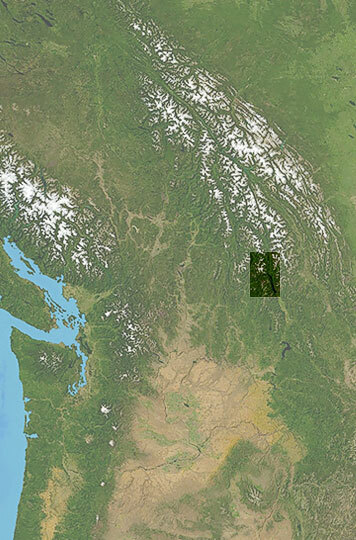 The highlighted rectangle shows the position of Kootenay Lake in western North America. This region is enlarged in the right image, which can be zoomed and panned to reveal even more detail. I am indebted to Geogratis for the images which I assembled to create the detailed view of the region around the Kootenay Lake, and to Zoomify for providing the means to present it in this document.